Grounded in Gnosticism, dubious historical scholarship, and hyper-individualism, liturgical dance is by its nature unsuited to Catholic worship. Please take “Lord of the Dance” out of your hymnbooks, assuming you don’t attend a Gnostic church. Sydney Carter wrote it in 1963, based on the apocryphal, second-century Gnostic Acts of John, where Jesus is supposed to have led his disciples in a round dance before his death. As the Lord of the Dance, he was simply an avatar of a cosmic principle. In line with Gnostic thought, Jesus was not both true God and true man, but only a kind of pure spirit, who disguised himself in a cloak of matter. Because he wasn’t really a man, he couldn’t really be killed. So, for Gnostics, some kind of trick occurred at the crucifixion: some taught that a switch was made, so that a surrogate or disguised stand-in (some said Joseph of Arimathea) was crucified instead, while Jesus watched from far off. Other Gnostics made Jesus’ body a kind of puppet that appeared to undergo torture and death, while in fact the “real” Jesus, residing in pure spirit, laughed at their foolishness, and eventually sprang away from the cross. (“I am the dance, and the dance lives on.”) This Jesus, a sort of cosmic trickster and shape-shifter, is captured in the Acts of John. The round dance and its little song were supposed to be part of an initiation ceremony after the Last Supper, in which Jesus, standing in the middle of a circle, sang in order to achieve an ecstatic separation from his body in preparation for his Passion (thereby “supplementing” Matthew 26:30: “And when they had sung a hymn, they went out into the mount of Olives”). This is the Gnostics’ secret teaching on the Last Supper, assumed by them to have been kept out of the Gospel accounts because it was the true heart of the events described, and could not be told to the unworthy. In Exodus 15, “Miriam the prophetess, Aaron’s sister, took the timbrel in her hand, and all the women went out after her with timbrels and with dancing.” In 2 Samuel 6:1-5, David “and all the house of Israel,” as the Ark of the Covenant was being rolled into Jerusalem, celebrated “with all their might before the Lord, with songs and lyres and harps and tambourines and castanets and cymbals.” And in Psalms 149 and 150, we read that “they shall dance in praise of his name, play to him on tambourines and harp!” and, “Praise God in his holy place…Praise him with tambourines and dancing.” This might in theory be an inspiration for dance as part of worship in His holy place, which is to say (in line with Exodus 32:19, in which the Jews dance before the idol of the golden calf), in the place where worship is directed to the true God. Nevertheless, there is no evidence that dancing was ever a part of Temple worship. There was dancing at annual Jewish religious festivals (outside the Temple itself), and done in groups separated by gender. Certainly people danced after weddings, just as we do today (Matthew 11:16-17 says, “But to what shall I compare this generation? It is like children sitting in the market places and calling to their playmates, ‘We piped to you, and you did not dance; we wailed, and you did not mourn’”). Then there was the banquet celebration for the Prodigal Son’s return. And, of course, there was what Salome did for Herod, but that would hardly qualify as something to inform Christian worship. Apart from the spurious round dance in the Acts of John—that’s it, for dancing. In medieval times and later, there was folk dancing at festival celebrations outside churches, drama reenactments of miraculous scenes in the lives of the saints or of Bible stories, and mystery plays. And there were pilgrimage processions, such as the Corpus Christi procession or the touring of neighborhoods by decorated statues or relics brought from churches, sometimes done with participants coordinating their steps or other movements, with everyone having a joyful time. This is all quite robustly Catholic. But none of this dancing actually intrudes into the sacred liturgy of the Mass itself, just as dancing was not part of Temple worship in ancient Israel. Until recently, Catholics had always saved their dancing for outside the church—or at least not during the liturgy itself. I live in a “primitive” culture based on hyper-individualism and the supremacy of “private judgment,” and this certainly manifests itself in the variety of “worship services” we perform. And one of the most controversial is “sacred dance.” Is this acceptable liturgical practice? It seems to me that the answer should turn on whether the true God—or a golden calf—is being praised, and whether the praise being offered aspires to be worthy of the perfect sacrifice made at the altar in the sanctuary. One of the roots of today’s liturgical dance lies in the revolt against spare Calvinist, Reformed worship, which made itself felt in the late Romantic ambiance of 19th century Europe. In Victorian and Edwardian England, this was manifested, among other ways, in the art of the Pre-Raphaelites, in the antiquarian yearning for folk and rustic forms of song, dance, and design, and in the self-conscious decadence of Oscar Wilde. In the Anglican Church, it was manifested in surprisingly widespread interest in the luxuriantly exotic, such as spiritualist trance mediumship, occultism, and Theosophy. As liturgy, it all still reeks of irony, of play-acting—and therefore of blasphemy. Blasphemy because one does not create “one’s own” God; one can only make a space for Him. T.S. Eliot, in a review of a couple of books on dancing, wrote, “is not the Mass—as performed, for instance, at the Madeleine in Paris—one of the highest developments of dancing?” I would have to say no, not really. The Mass is not a development of dancing; but dance may be faint shadows of what is most fully present in the liturgy. The sacred oracle would speak from somewhere else—underground, or from the “mud,” in a language non-verbal, from a time and place where the body and the spirit had not become severed from each other. Dance was the art form that best fit the bill. And so artists, in the fin-de-siècle twilight of Paris, clung to dancers, with a nostalgie pour la boue, as if they and their movements were the fountainhead of the sacred. It was in this atmosphere of religious decadence that American dancers Loïe Fuller and Isadora Duncan performed to adoring crowds, trampling on the received traditions of dance and founding—along with Serge Diaghilev’s Ballet Russe—a modern, revolutionary, fully incarnational (as it was perceived) art form. It is probably no coincidence that the embrace of the “fully incarnational” coincided with Fuller, Duncan, and Diaghilev being notoriously public homosexuals. Melting distinctions between public and private bodies, between particular shapes and forms (such as male and female), and between the sacred and the profane was part of the artistic revolution, with a utopian hankering after the divine, but unsure how to proceed except to abandon convention, and worship the god or goddess inside. That god was often Dionysius—“metaphorically” of course—and it is for this reason that coeds would sometimes swarm about the woods near the Berkeley campus, dressed in “Greek” drapery, playing nymphs, naiads, and maenads, to uninhibit their primal feminine sexuality. Ruth Dennis was born in New Jersey in 1879 and raised on a farm by her mother, who was a Christian Science healer. Christian Science, of course, bases its “revelation” on Mary Baker Eddy’s gnostic “discovery” that matter is not real. It is a delusion, fabricated and shaped by the mind. Ruth’s mother trained her daughter to dance by practicing the set of “poses” elaborated by French dramatic theorist François Delsarte, a sort of phrenology for the arts—perfect for a Christian Scientist—based on the assumption that fundamental poses had metaphysical significance: an order of significant mental states could be induced by certain physical poses, which, in turn, were themselves somehow expressions of the spiritual order of being. After years of Delsartean training, young Ruth went into the theater, and worked with producer David Belasco as a “skirt dancer.” In 1907, while touring with Belasco’s production of Du Barry (starring “America’s most emotional actress,” Mrs. Leslie Carter), Ruth was sitting in a drug store in Buffalo one day, sipping a soda, when she noticed a poster advertisement for Egyptian Deities cigarettes that depicted a statue of the Egyptian goddess Isis, seated in her temple. Isis was the goddess who married her brother Osiris and, after he was killed, gathered up the parts of his body and reanimated him with her magic. It was a particular notion of Theosophists and scholars of the Sir James Frazer “Golden Bough” school of comparative religion that early Christian devotion to Mary was inspired by previous worship of the goddess Isis. Seeing the image of Isis in the ad inspired Ruth (by then she had changed her last name to St. Denis) with a vision for her career as a dancer. She began teaching dance and preparing her own productions of ensemble dance pieces, each of which she based on impressions she received from the “Spirit within” about fragments of stories and images from other cultures’ myths, one of the first ones being Egypta, in which she appeared as Isis on her throne. 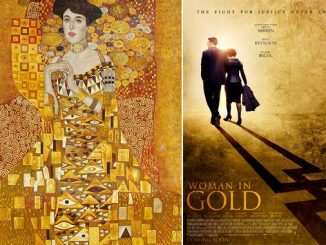 Ruth also worked up a production that featured her as Radha, the consort of the Hindu god Krishna, and then on into Balinese and Japanese myth, and included a portrayal of Miriam, prophetic sister of Moses. Her husband Ted Shawn, also a dancer, put on a production in 1920 of Les Mystères Dionysiaques with the “Denishawn” dancers at the Greek Theater at the University of California, conceived as an expression of the primitive religious sensibility; in 1922 Theosophist “prophetess” Katherine Tingley produced Aeschylus’ Eumenides as a “mystery play” at the Greek theater she and her students built at Point Loma. The linking of this new dancing to mystery plays was reinforced by a book by a Swedish pharmacologist, Louis Backman, who published a study of various outbreaks in medieval Europe of “St. Vitus dance”—most likely episodes of mass hysteria—in which large numbers of people would become possessed by dancing fits. Dancers liked the book as a kind of justification that “sacred dance” was practiced by the masses in the high-noon of Christendom (although suppressed by the clergy), but Blackman’s actual approach was to research whether these mass outbreaks could have been induced by the ingestion of forms of hallucinogenic fungal ergot in tainted wheat or rye. Was all of this poly-cultural impressionism much different from the Victorian “Druids” cavorting about Stonehenge? Not really—Ruth based her dances from these different cultures not so much on a deep understanding of their cultures of dance or religion, but on what she was “inspired” to put together based on fragmentary knowledge at best, but always guided by her “Spirit within.” It certainly made a big hit, considered “revolutionary” and daring by her audiences, but in retrospect, they seem like not much more than the amateur productions of an athletic little girl at play, “dressed up” in costume. Ruth St. Denis and Ted Shawn separated in 1930 and the Denishawn dancers dissolved, but afterwards Ruth wrote that her ability in dance to bring forth worlds from the vast deeps within her increased. She began focusing more and more on herself as Mary, the mother of God and the supreme prophetess who would dance a new age into ecstatic existence. 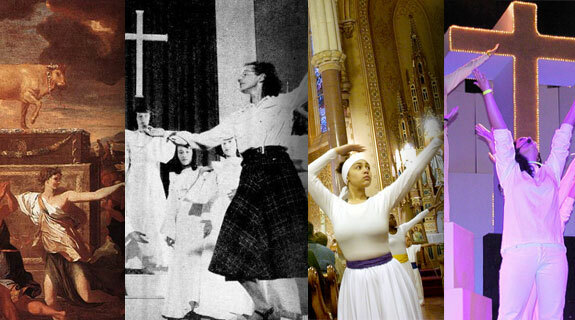 In 1934, living in New York City, she organized a group of dancers as the “Society of Spiritual Arts,” performing “weekly dance rituals” with “rhythmic choirs” in her “Church of Divine Dance.” During the Christmas season that year, she led her dancers in performing “The Masque of Mary” at Riverside Church and then at the Rutgers Presbyterian Church in New York City. It was in churches of the Reformed tradition—with its strong emphasis on attenuating or even eliminating the “Lord’s Supper”—that “liturgical dance” was first welcomed. For a Catholic, the Incarnation is realized with a celebration of a liturgy with the Eucharist at its center. The Reformed churches’ leeriness of liturgical tradition and “priestcraft,” its consequent emphasis on individual inspiration, and its concomitant search for outward worldly signs to demonstrate the justification of God’s election, seems to have led to a certain eagerness to adopt a variety of ad hoc displays and individual performances of sanctity. From a Catholic point of view, Reformed churches may designate part of their church building as a “sanctuary,” but this is an extended, metaphorical use of the word. For a Catholic, the full acceptance of the Incarnation means that in the fullness of time, God himself demonstrated the form in which he wishes to be worshipped, and we cannot melt away or disregard that form in order to replace it with individually inspired performances. If there is no real priest in a Reformed church, but only a “presider” or “worship leader” or preacher—just one believer among the “priesthood of all believers”—then why not give everyone a turn at presiding? The Rev. William Glenesk of Brooklyn Heights Spencer Memorial Presbyterian Church—who had been trained in dance—first welcomed puppets into church services. Glenesk also created controversy about introducing troupes of jazz dancers into his services—including a collection of dancers from the Broadway production of “Boys in the Band,” in order to inspire in his congregation a new consideration of homosexuality. Ruth St. Denis collected together “rhythmic choirs” in New York City, but the idea was taken up by and spread through the work of Margaret Palmer Fisk. She was the wife of the Rev. Chester Fisk, an “old-time square-dance caller,” and pastor during the late 1930s through 1950s of the Church of Jesus Christ (Reformed Church) at Dartmouth College in Hanover, New Hampshire. Mrs. Fisk was the daughter of Albert Palmer, president of the Chicago Theological Seminary, and had studied theology there briefly. Besides weekly square dances in the church twice a week, the Church of Jesus Christ—on Mrs. Fisk’s initiative—organized “rhythmic choirs” of girls, who eventually began “illustrating” with modern dance movements Rev. Fisk’s preaching in church on Sundays. In March 1948, Life magazine published a feature story about them, complete with photographs: “Church Dancers: girls interpret hymns and psalms for a New England congregation.” Mrs. Fisk continued her devotion to “sacred dance” throughout her life and wrote several books on it. In 1956, she also helped found the Sacred Dance Guild, which continues today with a worldwide membership and offers workshops with the problematic (from a Catholic or Orthodox point of view) aim of “Creating Ritual through Dance”—as if real ritual was “created” by its participants. As one might imagine, among Catholics, “Spirit of Vatican II” congregations—especially those who have done away (as far as possible) with distinctions between priest and people and erased lines dividing off the sanctuary—are drawn to sponsoring these workshops. As with the dancing Victorian “Druids,” contemporary practitioners of “sacred dance” tend to elaborate dubious historical lineages in order to justify their activities—such as the bogus tradition of walking (or dancing) the “labyrinth” at Chartres Cathedral, invented and promoted by American Episcopalians. This provides them a place to talk about “restoring” something supposedly lost or driven underground, presumably suppressed by all those male priests who were opposed to liturgical egalitarianism. How Protestant (and Gnostic) all that “hermeneutic of suspicion” is—“Obey God, not Man” is fine, except when “God” becomes “Me.” And how can it not, when the guiding force is the “Spirit within”? Later, after the nave had emptied out, a small girl in our congregation found her way to the front of the church, went up the steps and into the chancel where I had danced, and imitated me, dancing around in that empty space. It was so symbolic to me—that people will come into the space of the altar and just take it over and say, “It’s my altar; I never thought of it that way.” It’s not the preacher’s altar; it’s not mine to preside over as a clergyperson who happens to be able to dance. That space is our space. For me my dance, completed by the little girl’s, was an integrative event. The interview appeared in an article entitled “To Animate the Body of Christ.” The title is a clear echo of Ruth St. Denis’ Isis, animating the body of Osiris, and of her performance of the “Masque of Mary.” It is the same spirit animating much of the “liturgical dance” that appears in churches today. It is centered on “prophetic” and “inspired” performances of women challenging the male hierarchy, asserting their ecstatic and self-justifying rights to the sanctuary as oracles of the New Age and the truest vessels of the divine.